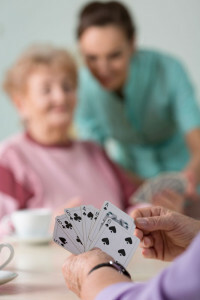 Auburn Village offers activities that are stimulating and enriching to the lives of our residents. The activities promote structuring of leisure time and provide opportunities of choice, so that the residents have control of their daily lives. Empowerment Activities: Activities that offer opportunities for volunteering at Auburn Village and in the community. Throughout the year, there are a number of social activities including cooking classes, live entertainers, or arts and crafts. Residents have also started some of their own special groups that meet weekly such as our men’s or women’s groups. You may find our residents at community outings such as enjoying the DeKalb County Fair, visiting a museum, shopping at the mall or dining at a local restaurant. Many residents enjoy outings to local restaurants, movies, music concerts, theater performances, and more. During special seasons of the years, groups will go see holiday lights, decorations, parades and more. Auburn Village has hosted many special events throughout the years. We also have a many special guests and entertainers who perform for us on a regular basis. Our holiday events and birthday parties are in no way ordinary – we make every special event an occasion that won’t be forgotten! We give our residents the opportunity to lead a very full and happy life here at Auburn Village. We believe everyone should always enjoy life and have fun!